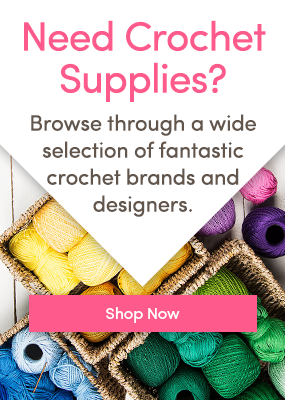 Crochet Club: Valentine’s Day Bunting! Festoon your house with Kate Eastwood’s darling Valentine bunting! We know you’ll “heart” this fabulous tutorial! With Valentines Day just around the corner what could be more cheery than some red and white heart bunting to decorate your home? And if romance isn’t your thing it looks just as pretty made in other colours to match your décor, whether it’s in your kitchen or to decorate a child’s nursery or playroom. The little flags and hearts are so quick to make that once started, you’ll find you have a string of bunting hooked up in no time at all. For my bunting I used King Cole Bamboo Cotton in Red (544) and White (530) for the Valentines bunting and in White (530) and Old Gold (625). I used a 3.5mm hook. You will also need some matching ribbon and I used a spray starch for my blocking. The terminology for this tutorial is all in British terms – but you can convert very easily using our handy conversion chart if you need US terminology! The flags are worked in DC and made from the bottom up, in an alternate pattern of one row of increase, followed by one straight row. Make a chain of 2 and into the second chain from the hook work 2 DC, CH 1 and turn. Row 2: Your next row is a straight row of DC. 2 st. Ch 1 and turn. Row 3: This is your increase row – work 2 DC in to the first stitch and 2 DC in to the last stitch. 4 sts. CH 1 and turn. Row 4: This is your straight row – work DC all along the row. 4 sts. CH 1 and turn. Row 5: You are now going to work another increase row, so work 2DC in to the first stitch, a DC in to each of the next 2 stitches and then work 2 DC in to the last stitch. 6 sts. CH 1 and turn. Row 6: Work a straight row of DC. 6 sts. CH 1 and turn. Continue working alternate rows of an increase row followed by a straight DC row until you have 24. Work a further 2 straight rows of DC. Finish off and sew in your ends. Now join in your red yarn and work a round of DC all the way around the flag. Work 2 DC in to each point to stop the flag from getting out of shape. Finish off with a SL ST and sew in the ends. For my Valentines Bunting I made all the flags in white but with the other strip of bunting I alternated the colour of the flags, and hearts, for a bit of variation. To make the little heart begin by working a chain of 11 and then work 3DC in to the second chain from the hook.Then work DC in to each of the next 3 STS , skip 2 chains , work DC in to each of the next 3 STS and then finish with 3DC worked in to the last stitch. Turn your work and work down the opposite side of the starting chain as follows: Work DC in to each of the next 3 stitches, into the 2ch space work a DC , 2 ch and a DC, work DC in to each of the last 3 stitches. Join back to where you started with a SL ST and then continue working a round of SL ST around the heart. Finish off. To make the perfect heart shape I worked 2 SL ST in to each st at the two tips of the heart, 2 SL SL into the bottom point of the heart and I skipped a stitch in the central point of the heart to make a clear V between the two heart tips. Once your heart is complete , pin it on to the flag and stitch in place with a needle and yarn. Once you have made all your flags you might want to block them if you feel they are not flat enough or you wish to give them a little bit of rigidity. To do this pin each flag on to a foam mat making sure it is stretched taut – I used one pin at each point – and then spray with either a water mister or some spray starch. Once each flag is dampened leave them to air dry in a warm place. Once finished, all that remains is to decide where to hang your bunting – and once your home is fully adorned the possibilities for presents are endless, from new baby to new home, to birthday to wedding – and of course, Valentine’s Day! Don’t miss Kate’s brilliant tutorials! Follow us on Bloglovin’ and be inspired!